In summary I have exampled a few myths which I believe show tell-tale signs of a past asteroid ocean impact event. 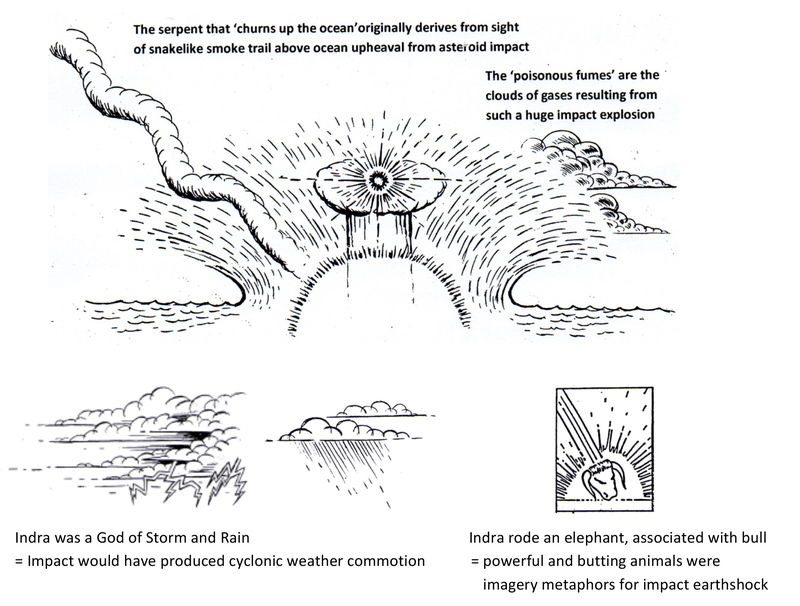 That a common recurring theme aligned with such ocean upheaval description in these myths is that of a serpent, a serpent I believe based on the very real sight of a windblown, weaving smoke trail left by a large incoming asteroid impacting into the ocean. As reiterated the ancients did not scientifically understand the impact event and could only turn to using metaphoric imagery to try to explain the different physical aspects of the strike. I have shown in cases that the ancients differentiated the different physical aspects of the strike and then projected deity personas’s onto each aspect. On one hand this satisfied the immediate need of the awestruck and traumatised ancients to understand the impact framed in the context of the personal involvement of omnipotent beings but on the other hand the disguising of the impact event behind the creation and invention of deity persona’s has effectively camouflaged and sidetracked our modern day comprehension of that past large impact event. We look back at such myth and read of the ‘primeval chaos of the waters of creation’ juxtaposed with serpent description and imagine it is just purely metaphysical, poetic invention on the part of the ancients when in fact it is based on very real events. Understandably as the myth has been passed down from generation to generation context has lapsed in many cases and over-imaginative minds have added embellishment to such mythic storylines that further distort and hide the truth that a major large asteroid impact has taken place in our near past. 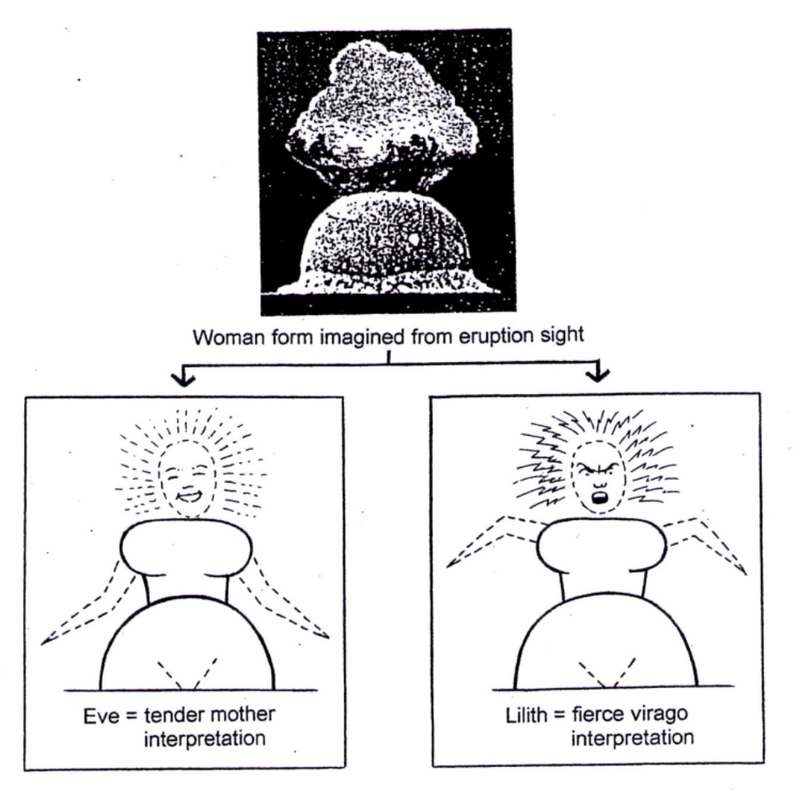 Because of the earth shattering violence of that past asteroid impact the gender interpretation of deities invented and projected onto the event was generally deemed masculine especially with the uprising path of the fireball inadvertedly rendering the schematised rock art figure form with a phallus like appendage. But anyone who has studied the ancient past will know that one of the prime icons of ancient religious worship was that of the Mother Goddess. I believe the Mother Goddess is another iconic creation derived from imagery interpretation of the same asteroid impact, eruption spectacle. As reiterated the impact detonation begins with the sight of a huge dome-like Wilson cloud shape. 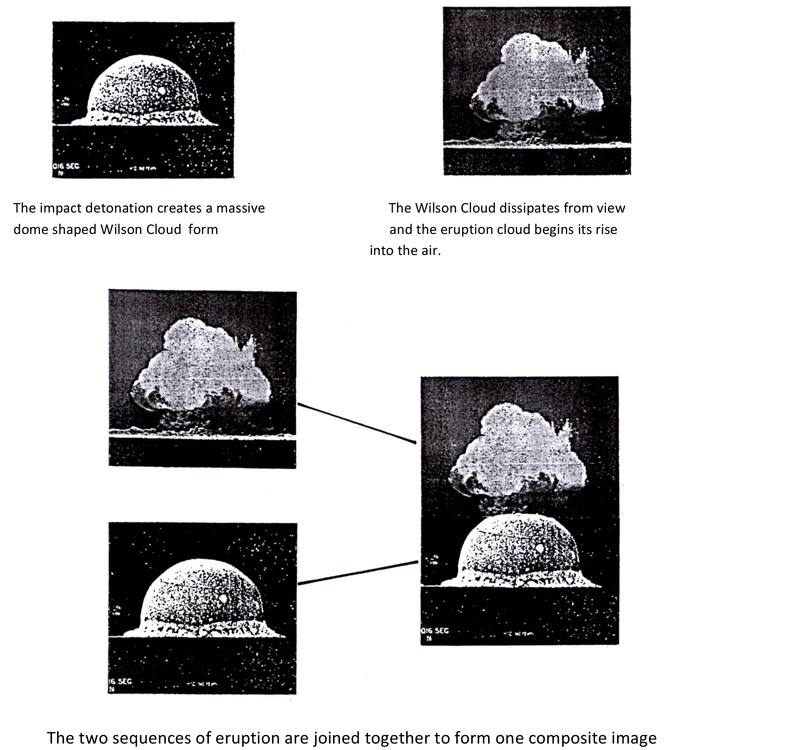 As stated the Wilson cloud then dissipates from view as the fireball rises up into the sky within its mushroom cloud. It is in that moment of time when the eruption cloud initially breaks upward from the Wilson cloud form before it assumes its full mushroom cloud shape that is the visual origin point of the Mother Goddess image. And another instance where those two eruption sequences were later joined together by ancient artists to form one composite imagery invention. With the two eruption sequences joined together the visual result was that of a very familiar form to the ancients. The dome shape of the Wilson cloud was imagined to be the large hips of a woman. 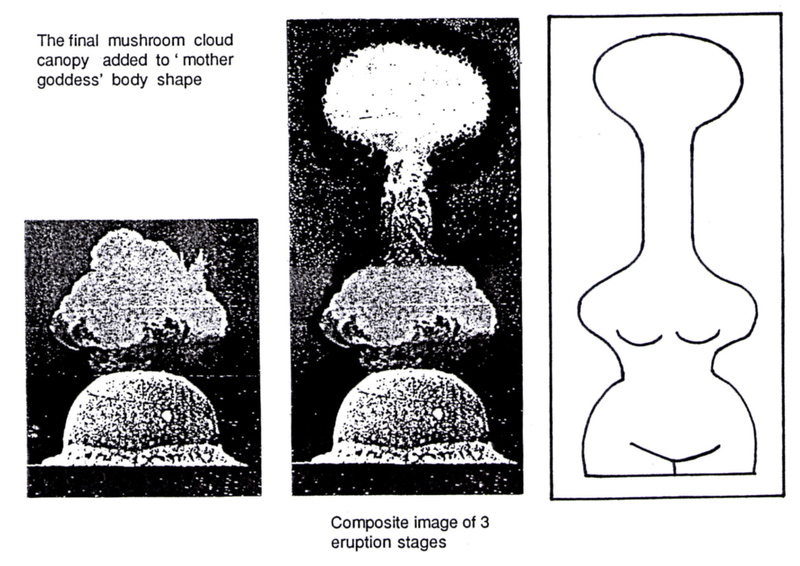 The mushroom cloud above with billowing breast like protrusions was imagined to be the upper torso of a female form. Thus from this visual circumstance the Mother Goddess image was born. While a Mother Goddess conjures up a very idealised feminine form initial mother goddess idol representations were very visually coarse unfeminine images. They were squat, armless and legless, with grossly large hips, buttocks and shoulders topped by an indistinct head sitting on a very unlady-like thickset neck. Their grossly distorted obese body shapes were not I believe based on human female forms but ancient artists were purposely distorting such human features to try to follow and capture the squat woman like figure form they imagined from the eruption spectacle. That would explain why such figurines have no arms or legs or facial features for there were no arms or legs or heads in the eruption spectacle. 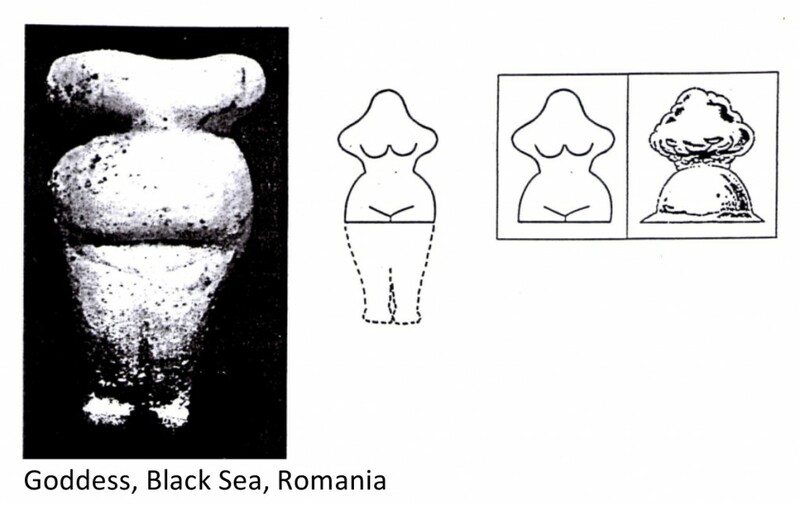 Legs have been added to this Black Sea figurine below but as you can see an abrupt line bisects where they drop from the squat female like torso. I believe the artist has purposely used this line to demarcate and visually show to the viewer that the legs are a clear artistic ‘addition’ to the torso above. That while no legs were sighted in the eruption spectacle as time passed the circumstances from which the goddess originated were lost on succeeding generations of artists and so they began to add features like legs to better accommodate the human persona they had projected on the core eruption sight. Not realising the image they copied afresh to continue its worship was based on a eruption blast form and not a real female form at all they unwittingly, but understandably, introduced further feminine characteristics to their idol representations including adding legs to the core mother Goddess image as the artist has done above. Yet another type of Mother Goddess figurines have usually long necks. The answer is quite simple. Although the ancient artists captured the ‘squat female form’ from the initial eruption sequence the eruption cloud went on to rise higher into the sky taking on its familiar mushroom canopy shape. 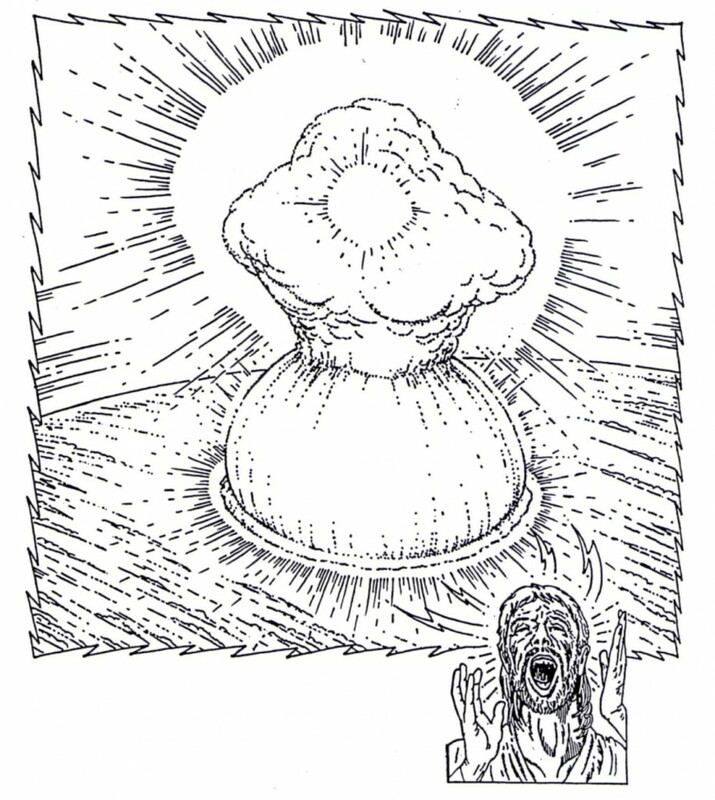 That being the case some artists faithfully juxtaposed the end part mushroom cloud eruption sight onto the earlier squat Mother Goddess body and so the visual result was mother Goddess’s with long necks. As outlined the schematised upraised armed, bowlegged rock art figure form was incorporated into religious iconography, deity personas were projected onto the image and worshipped. 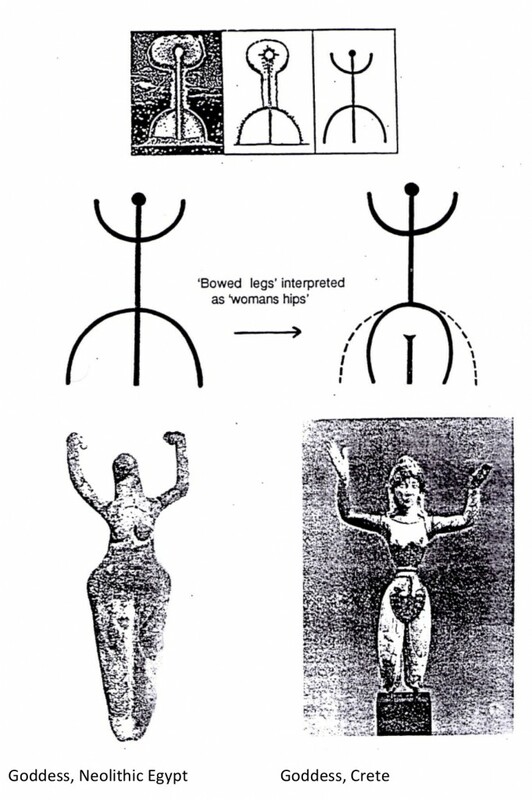 Over time the original bowlegged rock art form was reinterpreted as the hips of a female and so this other line of visual reinterpretation from the same eruption spectacle also became used as the basis for Mother Goddess iconography. As time passed succeeding generations of artists ‘fleshed out’ the initial schematic rock art image and gave it increasingly human characteristics, in part due to the increasingly naturalistic skills of the temple artists who produced such religious imagery. Obviously as such imagery became more humanized its real eruption basis became increasingly disguised and camouflaged to later generations. They only knew such imagery held great religious significance to their forbears and continued to reverently worship such iconography. If we turn to myth we read that Anat, pictured above, was a war goddess who ‘slaughtered many and waded in the blood of her enemies’. If her image subliminally represents and projects the eruption form of a large asteroid strike it is only natural that her characteristic attributes would align with the death dealing destruction such a large impact would incur on the population and so she is duly identified with human slaughter in myth. As we know the mother goddess is mostly identified with motherly characteristics, of love and tender nurture. But because she also represents a death dealing impact of great destruction some races, to reconcile such extreme opposing characteristics, created deities with split personalities or more than one persona to accommodate that dichotomy. The Hindu Goddess Devi has two main apects. As Devi, Uman, Gauri, Parvati she embodies the tender mother goddess, lover persona. As Durga, Kali, Chandi, and Bairavi she embodies the fierce,warring, bloodthirsty virago, attributes that relate to the death-dealing aspects of the asteroid impact. The wife of Scandinavian God Odin also had a dual personality. As Frigga she was the tender mother persona and as Freya, the warring virago. In the Bible Adams wife Eve represents the tender mother goddess but we are told Adam had an earlier wife Lilith who was a succubus and virago, another instance where more than one deity was created from the same eruption event to each accommodate and represent the extreme dual personality characteristics of deities the ancients imagined and projected onto the eruption event. Copyright 2014-2018. Asteroid Impact Mythology. Website background image: NASA, ESA, M.A. Garlick (space-art.co.uk), University of Warwick, and University of Cambridge.